ABU DHABI, United Arab Emirates, July 26, 2016 (ENS) – The solar-powered electric plane Solar Impulse 2 made history just after midnight today by completing the first circumnavigation of the Earth powered only by energy from the Sun. The plane landed at its starting point in Abu Dhabi after a final two-day flight from Cairo, Egypt, the 17th leg of the nearly 17-month-long journey. The project is led by Swiss pilots Bertrand Piccard, initiator and chairman, and André Borschberg, co-founder and CEO. Taking turns at the controls of Solar Impulse 2 the two pilots succeeded in their dream of achieving the first round-the-world solar flight. Solar Impulse 2, a lightweight aircraft with the wingspan of a Boeing 747, has just completed a 27,000-mile (about 43,450-kilometre) journey around the world. It is entirely powered by sunlight through 17,000 solar cells built into its carbon fibre wings, with no fuel or polluting emissions. 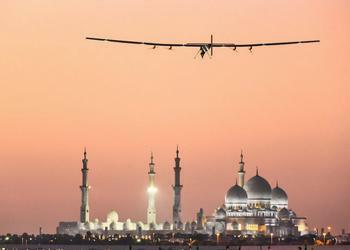 Piccard believes the Solar Impulse 2 could inspire global action to tackle climate change. With its carbon fiber structure, electric engines, solar panels and lithium polymer batteries, the plan could help change the discussion on environmental protection and the climate crisis from one about funding to one about motivation and solutions, he has said. United Nations Secretary-General Ban Ki-moon Monday hailed the determination and courage of the Solar Impulse flight team as the aircraft was about to complete its around-the-world journey. “You may be ending your journey, but the journey to a sustainable world is just beginning,” Ban said to the aircraft’s pilot Captain Piccard, via Skype, the global, online video conferencing tool. “You are helping pilot us to that future through your vision, your determination, your courage, and your inspiration and also your great example,” said Ban. The UN chief last met the airplane’s pilots, as well as Solar Impulse’s ground crew, in June when the aircraft arrived at New York’s John F. Kennedy Airport one of the stops on its voyage of circumnavigation. Ban had a quick look inside the aircraft. The Swiss-made plane can reach an altitude of some 30,000 feet, flying at a top speed of about 70 kilometres per hour. After 12 years of intense research and development, on March 9, 2015, the Solar Impulse 2 began its attempt to fly around the world with no fuel. The journey took Piccard and Borschberg from Abu Dhabi, the departure and arrival host city, to India, Myanmar, China, Japan, across the United States from Hawaii to New York, Spain, Egypt and back to Abu Dhabi. As with all great firsts, there was no pattern to follow. Strategies had to be invented on the wing to allow Solar Impulse 2 to fly across the Pacific for five consecutive days and nights, and become the first solar airplane to accomplish an oceanic crossing. This historic and record-breaking flight from Japan to Hawaii was achieved by Borschberg in July 2015, who says the team has proved that clean technologies can accomplish incredible things. Beyond this historic milestone, the two Swiss pioneers will continue to urge the global implementation of energy-efficient solutions through the creation of the International Committee for Clean Technologies and leverage the expertise and technology gained over the years in Solar Impulse by launching new innovative projects, such as the development of solar powered drones. After the eight world records set by the Solar Impulse prototype, when it became the first solar airplane ever to fly through the night, between two continents, and across the United States, Piccard and Borschberg have now set another world record, successfully piloting Solar Impulse 2 on the 2015-2016 First Round-The-World Solar Flight.